(noun) The malar stripe is a marking on a bird's face that extends from the base of the bill to the side of the neck, usually in a downwards and backwards direction. The thickness, shape, length and color of the stripe can vary, and it may be sharply defined, blurry or broken. On some birds, the malar stripe is a distinct mark, while on other species it may be the border between contrasting colors on the cheek, neck, chin and throat. The malar stripe can be a key field mark on a bird's face, but not all birds have visible malar stripes. The malar area of the face is from the base of the bill extending down and slightly backwards, well below the eye, to underneath the front edge of the auriculars near the bottom of the bird's head. All birds have this facial area, but it is not always distinct. When this area of a bird's face is a different color that contrasts with adjacent feathers, including the chin, throat and auriculars, it is called a malar stripe. Not all malar stripes are the same. On some birds, they can be thick and prominent, such as the bold stripe on a northern flicker or the wide whisker of a pileated woodpecker. Other birds have very thin, faint stripes, such as the throat borders of some sparrows and kinglets. The stripes may be the same width from top to bottom, or the shape may grow wider toward the bottom, further away from the bird's bill. In most cases, the malar stripe is a patch of feathers with a contrasting color, though for some birds, the malar area may be a bare patch of colored skin. Both types of markings would still be called a malar stripe, and both can be valuable for identifying birds. There are other significant field marks on a bird's face that can look similar to a malar stripe. Understanding the differences between them can help birders better identify the malar stripe and use it for proper identification. Lores: This is the area between the base of a bird's bill and the front of the eyes. It is above the malar area and does not extend down the face. The lores may be feathered or bare and can often be a distinct color, just as the malar stripe may contrast with the rest of the bird's face. Auriculars: The auriculars are the cheek area of a bird's face, a patch below and behind the eyes. This is adjacent to the malar area, but does not extend to the base of the bill like a malar stripe. Throat: This is the front of a bird's neck and is next to the front edge of the malar area and any malar stripes. A bird only has one throat, however, but has a malar area and possibly a malar stripe on both sides of the face. Eye Line: This is a distinct marking that extends through a bird's eyes and may stretch to the back of the head. While it can appear similar to a malar stripe, an eye line does not extend at an angle down a bird's face, but instead is a straight, level line between the base of the bill and the back of the head. The malar stripe can be a key field mark for bird identification when compared to other head markings and the bird's overall plumage. On some species, the malar stripe can also help identify birds by gender. 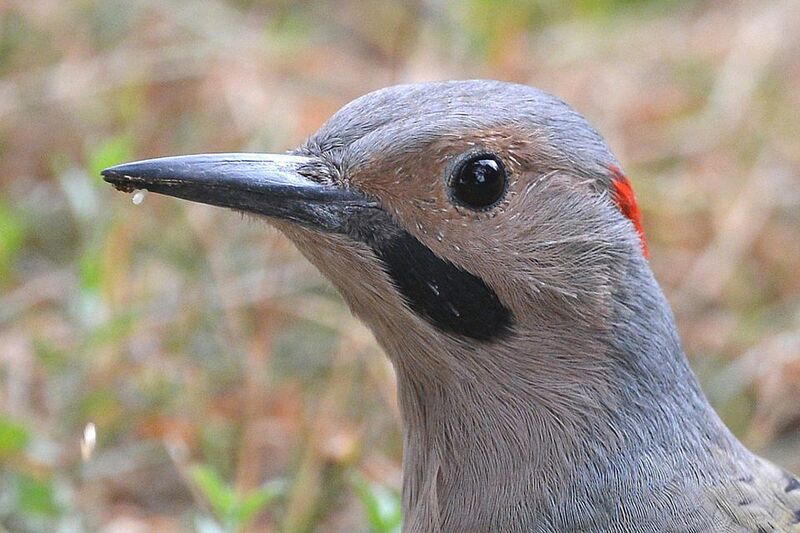 Male northern flickers, for example, have malar stripes while females do not, and on pileated woodpeckers, the male's malar strip is crimson while the female's is black. In addition to woodpeckers, other species that have prominent malar stripes include many falcons, brown thrushes and sparrows, though these stripes can be found in at least some birds in most bird families.